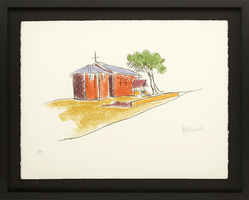 In the early part of the new Millennium, Nelson Mandela turned his talented hand to creating unique sets of colour sketches. He completed over 20 sketches that include images he found meaningful, both symbolically and emotionally during the period of incarceration on Robben Island. The works were completed in a series of colour separations, first the strong black crayon lines providing the guide, then he selected colourful shades for each image. It is interesting to note that he completed no final original piece, only a series of separations which, when overlaid, create the final picture. The editions were then signed individually by Mr Mandela. His artist's motivations written in his characteristic neat handwriting, offer an insight into the thoughts behind the colour images he created. Nelson Mandela's lithographs were printed under the supervision of Professor Steven Inggs at the printmaking department of the University of Cape Town to the highest standards of printmaking. The quality is equal to the production of the finest French and British ateliers. 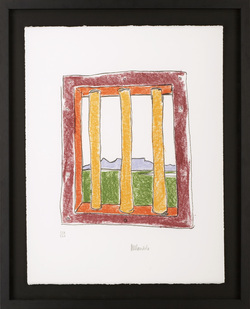 This sketch depicts the view into Nelson Mandela's prison cell through the open cell door. The few possessions that prisoners were allowed have been emphasised in colour, as they are symbolic of a link with a reality outside the harsh prison regime. Each Lithograph comes with a certificate of authenticity from Cecil Greenfield, a member of the forensic science society (UK) and South African forensic signature expert. Their meagre possessions typically included letters and photographs of family and friends - pieces of paper that acquired tremendous emotional value to prisoners. This sketch depicts the view of the lighthouse on Robben Island. `The Lighthouse' is a warning beacon to ward off passing ships from the treacherous shores of the island, which has a long history of shipwrecks. To Nelson Mandela the lighthouse on Robben Island resembles a contradiction as both a beacon of hope and a beacon of oppression. Nelson Mandela uses the expanse of the sky behind the lighthouse to emphasise the solitary nature of this structure silhouetted simply and quietly. "Today when I look at Robben Island I see it as a celebration of the struggle and a symbol of the finest qualities of the human spirit, rather than as a monument to the brutal tyranny and oppression of apartheid. Robben Island is a place where courage endured in the face of endless hardship, a place where people kept on believing when it seemed their dreams were hopeless and a place where wisdom and determination overcame fear and human frailty. It is true that Robben Island was once a place of darkness, but out of that darkness has come a wonderful brightness, a light so powerful that it could not be hidden behind prison walls, held back by prison bars or hemmed in by the surrounding sea. In these sketches entitled: My Robben Island, I have attempted to colour the island sketches in ways that reflect the positive light in which I view it. This is what I would like to share with people around the world and, hopefully, also project the idea that even the most fantastic dreams can be achieved if we are prepared to endure life's challenges." This sketch depicts a view of Robben Island where new prisoners would first set foot on the island. 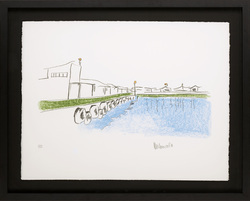 Nelson Mandela made a decision to highlight the ocean and landing stage in colour, two elements which clearly have significant symbolism in his interpretation. Prisoners would be stripped and searched on arrival and changed into prison clothes removing all signs of external personal identity. The landing stage would be their first contact with the prison island and the sea their last contact with freedom.